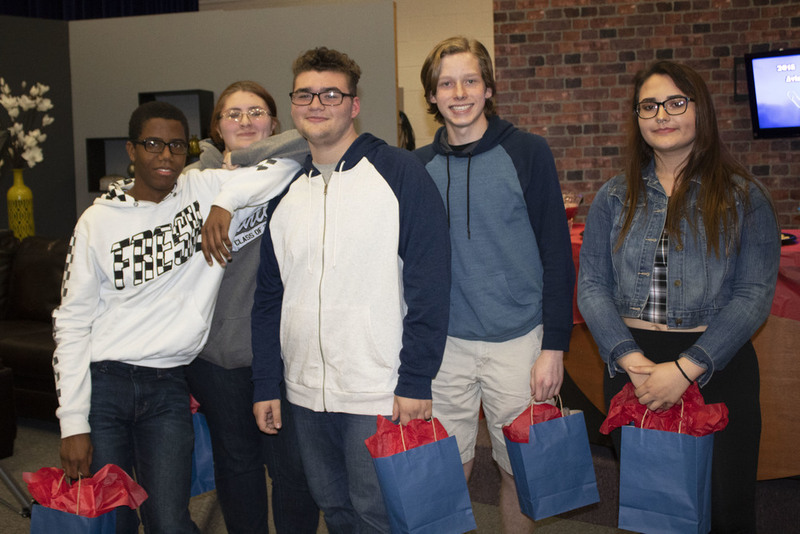 In an unusual move, Alliance High Media Arts students stayed out of the studio to produce their films for the eighth Aviator Shootout Nov. 7-9. Actually, that was a requirement for the competition. Students were not allowed to use the high school building in the 48 hours they were given to create a five-minute film. Juniors and seniors were divided into three groups of five. Each group was assigned a different prop, production technique and catch phrase. The only thing they were allowed to do before the 48-hour period was write scripts. They also learn how to do the many tasks required to produce a film. The students got to know each other better throughout the process. They also were able to learn from their mistakes. The competition was judged by five members of the community. The film that won first place was “Code German,” about a secret agent who stops an evil German from destroying the world. Drew Barker, Emma Courtwright, Madison Puckett, Maurice Jefferson and Nate Heitzenrater created that film. Junior, Eddie Dillon was named MVP for “going above and beyond,” not only with the Aviator Shootout, but in his Media Arts class. Traps Sports Center, Carter’s Copy Center, Buffalo Wild Wings and Hot Pots Pottery contributed the prizes given to the winners. The event was sponsored by Alliance Ventures, Mayor Alan Andreani, Robertson Heating Supply, Groves Appliance and Cassaday Turkle Christian Funeral Home. Their sponsorship assisted in the purchase of food for the event, as well as prizes. Prizes include gift cards supplied by donors, as well as Bluetooth earbuds, a Spectrum jacket and $100 packages for first-place winners. Second place received $50 packages and third received $45 packages. As MVP, Eddie Dillon won a $100 Amazon gift card. Students also submitted their finished films to local film festivals.